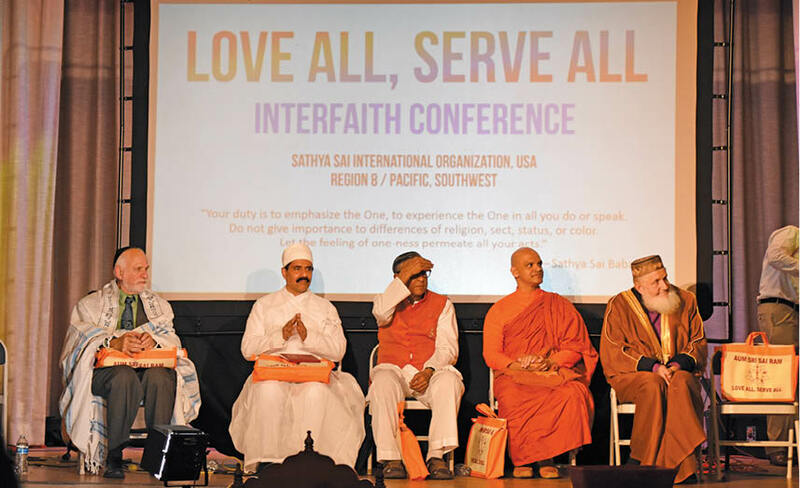 The ‘Love All Serve All’ Interfaith Conference was organized on April 7th, 2019, by the International Society of Sathya Sai Baba and the Sathya Sai Centers of USA, with the purpose of promoting the spirit of unity within diversity, which was amply portrayed by spiritual leaders from six major religions of the world. Venerable Sumitta represented Buddhism, sharing Buddhist prayers and spoke on non-violence and explained how all of us are God’s children belonging to one global family. Rev Susan Chamberlain, Director of Interfaith Coalition for the Environment, represented the Christian faith, stressing the importance of taking care of our environment through the teachings of different religions. She was followed by Rabbi Arthur Perles, Doctorate in Divinity in Jewish Studies, who gave a speech with Hebrew chants. Hinduism was represented by Dr. Acharya Mahadevan, Secretary – Chinmaya Mission, who emphasized on oneness and God’s presence in all. Lastly, Islam was represented by Sheikh Yousouf Estes, who urged the audience to have undaunted faith in God – the only supreme power. Leah Divecha – Wowing With The Violin!